This article is about Squirtle's appearance in Super Smash Bros. Ultimate. For other uses, see Squirtle. Also, for information about Squirtle in regards to Pokémon Trainer, see Pokémon Trainer (SSBU), Ivysaur (SSBU), and Charizard (SSBU). Squirtle is a playable character in Super Smash Bros. Ultimate. It was confirmed on June 12th, 2018. It is part of Pokémon Trainer's rotation along with Ivysaur and Charizard. Along with the Pokémon Trainer, Squirtle is classified as fighter #33. Michele Knotz and Rikako Aikawa reprise their roles as Squirtle after having previously voiced the character in the Pokémon anime and Super Smash Bros. Brawl. Squirtle is the smallest and lightest out of the Pokémon Trainer's Pokémon, with it being tied with Mr. Game & Watch for the 3rd-lightest character in the game. Squirtle's small size makes it a hard target to hit, but also gives its attacks poor range. Squirtle has decent mobility with average dash speed and air speed, although it has high walk speed and air acceleration. Squirtle also has the ability to crawl and wall cling. One of Squirtle's strengths is that all of its attacks outside of its smash attacks have low startup and ending lag, giving it a very strong combo game. Squirtle has multiple ways to set up into its aerials and its aerials are all fast and have good combo potential, giving Squirtle decent edgeguarding. Water Gun can also be used to edgeguard opponents as well as keep opponents out. Squirtle also has a decent grab game, as its back throw can KO opponents and its down throw is a potent combo starter. Lastly, as mentioned before, Squirtle is a very small target, making it difficult to hit. However, Squirtle does have some weaknesses. Squirtle's overall damage output is poor, and outside of its smash attacks (which are slow) and its back throw (which can have trouble killing away from the ledge), Squirtle lacks any decent KO options, especially since some of its previous KO options (such as forward aerial and down throw) were weakened, making it very difficult for Squirtle to close out stocks on its own. Squirtle's light weight and unimpressive recovery also make its endurance very poor, and it is no longer resistant to fire attacks due to the removal of type effectiveness, further hindering Squirtle's endurance in certain matchups. As previously mentioned, Squirtle has poor range throughout its attacks and it lacks a damaging projectile, making it very easy for Squirtle to be out-spaced by characters with superior range. Overall, Squirtle should mainly be used to quickly rack up damage with its strong combo game while it and its opponents are at lower percents and Squirtle should be swapped out with Ivysaur to close out the opponent's stock and to survive for longer. 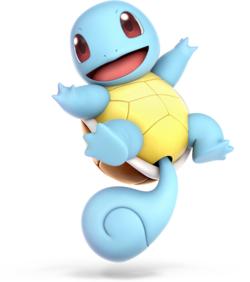 Squirtle was previously considered the strongest party member of the Pokémon Trainer's team in Brawl, due to a combination of its quick mobility overall, fast attacks, and excellent aerial game, which made it a potentially viable contender in competitive play. Possibly as a result, Squirtle has received a mix of buffs and nerfs, but was nerfed overall. Unlike the other party Pokémon, Squirtle's moveset has been reworked into newer, different attacks, with many of its standard attacks being altered. Squirtle has gained new or stronger KO options (such as its forward and up smashes having increased power and back throw), and has a stronger combo game due to the removal of hitstun canceling, with its down throw, forward aerial, and back aerial gaining more combo potential. Squirtle's specials are now stronger for repositioning, as Withdraw moves faster and has more priority, and Water Gun's push force and range has been substantially increased. As a result, it now plays quite differently from Brawl, as its combo initiators and KO options have been altered. The removal of stamina also removes one of Squirtle's big limiting factors, as it can now stay in battle until the player makes a tactical swap or Squirtle is KO'd. The general mechanic changes to Ultimate also heavily benefit Squirtle. As well as the afforementioned removal of hitstun canceling, Squirtle is no longer vulnerable to chain grabs or aerial grab release combos. However, Squirtle has received significant nerfs. While Squirtle's grounded movement is technically much faster, Squirtle has lost its multiple unique advanced techniques, most notably shellshifting (due to the change to its dash animation), hindering its grounded movement. Squirtle's aerial mobility has also been toned down (especially when relative to the cast), as unlike most returning veterans, Squirtle's air speed has been decreased (going from being one of the highest in Brawl to being merely average in Ultimate), which is further hindered by its decreased air acceleration. Squirtle's overall damage output is lower, making it even more dependent on combos and its speedy attacks than before, and while Squirtle has gained a few new KO options, they remain hard to land overall, and Squirtle also lost two of its most potent KO moves as well in forward aerial and down throw, in exchange for more combo ability. Squirtle also has less juggling potential mainly due to its up aerial sending opponents at a less favourable angle, as well as being weaker and having more ending lag. Lastly, the removal of type effectiveness hinders Squirtle more than the rest of its party, as its survivability during certain matchups is much worse, as it previously had a disproportionate resistance to flame attacks compared to the rest of its party's respective weaknesses. Overall, despite the many universal benefits Squirtle received, most of Squirtle's main weaknesses, including its poor range and KO power, have been further exacerbated, resulting in Squirtle being retooled to fit more in line with the speedy, combo-centric playstyle it used to represent in the Pokémon Trainer's team. As of now, it remains to be seen how Squirtle will perform without its advanced techniques and how it fares compared to the cast, although it is generally agreed upon that Squirtle is no longer the Pokémon Trainer's best Pokémon by a large margin. Squirtle's design and proportions have changed. It has slightly larger eyes, which are a darker shade of magenta and its nostrils and eyelids are less pronounced. It has a rounder head, stubbier arms and legs, and its shell has a sleeker, shinier design. It is more vibrantly colored overall, with its skin being a lighter shade of blue and the top of its shell being a lighter shade of brown with the bottom being a lighter shade of yellow. Due to these changes, it now matches its appearances in the more recent Pokémon titles. Much like other characters, Squirtle always faces the screen regardless of which direction it is facing, making its stance mirrored. Squirtle has a more upright stance. Squirtle is much more expressive, with its eyes changing size in certain animations. Squirtle is now proportioned correctly to the Pokémon Trainer in its victory poses. Squirtle's side taunt has a different ending animation. It now teeters clumsily after spinning on its tail. Squirtle has a new dash animation, now involving it surfing on a small wave of water. Due to Squirtle's new dash and turnaround animations, Squirtle can no longer shellshift, removing many of its advanced techniques. Squirtle no longer retreats into its shell outside of Withdraw, so cannot make use of armor frames. Squirtle has a new crouch and crawl animation, a comical defensive crouch while covering its head with its hands. These new animations do not shrink Squirtle's hurtbox as much, making it easier to hit Squirtle while it's crouching or crawling. Like all characters, Squirtle's jumpsquat animation now takes three frames to complete (down from 4). Squirtle walks faster (1.2 → 1.281). Squirtle dashes significantly faster (1.37 → 1.76). Squirtle's falling speed is slightly higher (1.3 → 1.35). Squirtle's gravity is higher (0.1067 → 0.128). Squirtle's air speed is slower (1.081 → 1.01), especially when relative to the cast. It has went from the 7th highest out of 39 characters to the 52nd highest out of 77 characters. Squirtle's air acceleration is lower (0.12 → 0.105). Squirtle's crawling speed is slower. The Stamina mechanic has been removed, eliminating the necessity of switching out Pokémon to restore their power. Type effectiveness has been removed. This affects Squirtle the most adversely out of the Pokémon Trainer's party, as it previously had a disproportionate resistance to the common flame attacks of the cast. This also hinders the effectiveness of Squirtle's water attacks against Charizard. However, this does improve Squirtle's endurance against Ivysaur's grass attacks as well as increasing the power of its water based attacks against Ivysaur. Squirtle's aerial grab release animation sends Squirtle much further out. When combined with the changes to aerial grab releases and the removal of chain grabbing, this makes Squirtle significantly less vulnerable to aerial grab releases as it no longer suffers from being a victim to many inescapable grab release follow ups (including an infinite chain grab from Zero Suit Samus). Spotdodge has less ending lag (frame 26 → 24). Spotdodge has more startup lag and a shorter duration (frames 2-20 → 3-16). Forward roll has less ending lag (frame 30 → 28). Rolls have a shorter duration (frames 4-19 (both) → 4-15 (back), 4-14 (forward) and back roll has more ending lag (frame 30 → 33). Air dodge has less startup lag (frame 4 → 2). Neutral air dodge has a shorter duration (frames 4-29 → 2-26) and has more ending lag (frame 40 → 53). Squirtle's full neutral attack has a different animation, now consisting of a punch, a jumping kick, and a roundhouse tail whip. The second and third hits of neutral attack have less startup lag (frame 5 → 4 (hit 2), frame 6 → 5 (hit 3)) and all three hits have a longer duration (1 frame → 2). Altogether, these changes make it no longer possible to block the second and third hits if the first hit connects. The third hit also has less ending lag (frame 36 → 31). The first hit of neutral attack has much less range, more startup lag (frame 1 → 2), and the first two hits deal less damage (3% → 2% (hit 1), 2% → 1.5% (hit 2)). The second hit can also no longer trip opponents and it has more ending lag (frame 21 → 24). Squirtle also no longer inches forward when performing the second and third hits, greatly hindering their range. Forward tilt has more startup lag and a shorter duration (frames 4-7 → 5-6). It also deals less damage (6% → 5%), although its base knockback was compensated (8 → 20), and has less range. The removal of hitstun canceling improves up tilt's combo potential at higher percents. Up tilt has less range and more ending lag (frame 18 → 20), hindering its combo potential at lower percents. Squirtle has a new down tilt, a ground-level leg sweep with a water effect. While it only hits once, it has further reach and less ending lag (frame 36 → 29). It also sends opponents horizontally and has more knockback, improving its reliability, KO, and edgeguarding potential. Down tilt has more startup lag (frame 6 → 8) and deals less damage (13% → 9%) and knockback (40 (base), 130 (scaling) → 50/73). Squirtle has a new dash attack: it lunges out with a kick with both feet, similar to Bowser's forward smash, which produces a corkscrew of water. Dash attack has less ending lag (frame 41 → 35) and the late hit has increased knockback (45 (base), 30 (scaling) → 70/50). Dash attack has more startup lag and a shorter duration (frames 6-22 → 8-17). The clean hit also deals less damage (9% → 8%). All of Squirtle's smash attacks use the drum beat sound rather than the twittering sound. Forward smash has been altered. Squirtle now quickly lashes a torrent of water in front of itself, instead of doing a tackle in its shell. New forward smash has less ending lag (frame 58 → 50), deals more damage (14% → 15%), and has increased base knockback (18 → 35), improving its KO potential. New forward smash has more startup lag (frame 18 → 20) and no longer has armor. Up smash reaches much higher and its late hits deal more damage (11%/9%/7%/5% → 12%/10%/9%/8%) and have increased knockback growth (90 → 92). The removal of DACUS (and more significantly pump sliding) greatly hinders up smash's approach potential. The strong hit also has more startup lag (frame 20 → 21). Squirtle no longer leaps up and pounds the ground to generate the torrents of water; instead, it points upwards as the torrents burst upward. The sweetspot also has altered knockback (70 (base), 87 (scaling) → 60/92). Squirtle has a new down smash: it spits out water around it low to the ground. New down smash deals more damage (11% → 13%), no longer has sourspots and has less ending lag (frame 52 → 40). Down smash has more startup lag with a shorter duration (frames 17-30 → 18-19 (hit 1), 24-25 (hit 2)) and decreased knockback (21 (base), 102/85 (scaling) → 50/74). Squirtle has a new neutral aerial: a midair cartwheel. New neutral aerial deals more damage (9% (clean), 6% (late) → 10%/7%) and has less ending (frame 46 → 42) and landing lag (12 frames → 8). The late hit also has increased knockback (15 (base), 100 (scaling) → 35/90). The sweetspot has altered knockback (20 (base), 100 (scaling) → 30/85). Forward aerial has less ending (frame 37 → 36) and landing lag (12 frames → 6). The late hit also deals more knockback (30 (base), 90 (scaling) → 50/94). Forward aerial's sweetspot deals much less damage (12% → 7%) and its knockback wasn't fully compensated (30 (base), 94 (scaling) → 50/96) hindering its KO potential. It also auto-cancels later (frame 27 → 35). Forward aerial's kick now produces a corkscrew of water. Back aerial is now a multi-hit move, and has Squirtle spin in a horizontal corkscrew while stretching out its tail, similar to Pikachu's back aerial. Back aerial deals more damage (10% → 11%) and auto-cancels earlier (frame 27 → 22). Back aerial's multihit properties improves its combo potential. Back aerial has more ending (frame 34 → 36) and landing lag (9 frames → 18). It also has slightly less KO potential as the final hit's knockback wasn't fully compensated (20 (base), 97 (scaling) → 55/95). Up aerial has less startup lag and a longer duration (frames 6-8 → 5-9). It also has much less landing lag (21 frames → 6). Up aerial deals less damage (11% → 7%) without its knockback being fully compensated (30 (base), 94 (scaling) → 40/115) hindering its KO potential and has more ending lag (frame 25 → 30) and auto-cancels later (frame 17 → 20). It also has a smaller altered hitbox, making it harder to land on grounded opponents, and it sends opponents at a different angle (80° → 64°), hindering its juggling potential. The final hit of down aerial has less startup lag (frame 23 → 22). Down aerial also has less ending lag (frame 50 → 45), landing lag (19 frames → 16), can auto-cancel with a short hop (frame 44 → 35) and the multi-hits deal more damage (1% → 1.5%). The final hit of down aerial no longer has a unique animation giving it much less range. It also deals much less knockback (70 (base), 105 (scaling) → 50/85), hindering its KO potential. Squirtle's grabs have new animations. Squirtle also no longer slides across the stage when connecting a dash grab. All of Squirtle's grabs have shorter durations (3 frames → 2) and standing grab has more ending lag (frame 30 → 35). Pummel is much faster (17 frames → 5). Forward throw deals less damage (9% → 8%). Squirtle has a new back throw where it lifts the opponent over its head and throws them behind it, similar to Dr. Mario's new back throw. Back throw has more KO potential. Back throw deals less damage (10% → 8%). The changes to hitstun canceling grants up throw combo potential at lower percents. Up throw has a new animation where Squirtle no longer goes into its shell. Up throw deals less damage (11% → 7%) hindering its KO potential. Down throw deals less knockback. This grants it combo potential but removes its KO potential, as it was previously the second strongest down throw in Brawl (after Lucas). Water Gun charges much faster, covers significantly more distance, and has a much stronger pushing ability, able to reach the entirety of Battlefield when fully charged and having enough pushing force to KO off-stage opponents by pushing them into the blast zone. It also has less ending lag (frame 70 → 64). Uncharged Water Gun no longer generates a damaging close-range hitbox, and acts like other charge levels. Withdraw is much faster and has high priority. Withdraw now stops on impact, preventing it from racking up further damage. It also has more startup lag (frame 19 → 23) and cannot be cancelled as early (frame 60 → 75). Waterfall has less startup lag (frame 10 → 9). Waterfall only hits 8 times instead of 10. Waterfall deals less damage (15% → 12.8%). Waterfall has softer, more realistic water sound effects. Pokémon Change is much faster due to no longer having to load the next Pokémon during every switch, and it can now be used in the air. Like in Brawl, it also offers brief invincibility upon switching out, though the quicker switch time allows it to potentially combo into another Pokémon's moves, or function somewhat as an alternative "air dodge". It also allows the user to choose the recovery that suits a situation best and it refreshes ledge invincibility giving Pokémon Trainer a unique stall option. Spamming Pokémon Change will grant no invincibility frames for a period of time, and now has a cooldown of around 2 seconds (which can be skipped by using a special move). Additionally, Pokémon Change no longer resets stale move negation, effectively weakening Ivysaur when Squirtle switches, and if it is performed off the edge of a moving platform, it will no longer skip the ending lag of the switch (although Ivysaur will still gain an extra mid-air jump if the technique is performed). Triple Finish has a different text box and animations, making it identical to how they appear in the Generation VII games. Squirtle can crawl, wall cling, and wall jump. 2% Squirtle punches, kicks, and then swipes forwards with its tail. The first hit comes out very quickly (frame 2), making it a strong tool to interrupt approaches. The combo generally links very reliably. The third hit KOs at about 200% at the edge of Final Destination. 5% Squirtle crouches down and spins, swiping forward with its tail. Can be angled. Comes out quickly (frame 5) and has low ending lag, making it a decent spacing tool, but it is weak. Squirtle's tail is intangible for the first 8 frames of the move. KOs at about 240% at the edge of Final Destination. 5% Squirtle hops up onto its tail, headbutting upwards. Comes out quickly (frame 5), ends quickly, and is weak, making it a potent combo tool; it can lead into a variety of moves depending on percentage, including itself, forward tilt, down tilt, neutral aerial, forward aerial, and up aerial. It can lead into up special for a KO as well, at about 130% on Final Destination. However, the move has poor range, especially horizontally. KOs at about 290% on Final Destination. 9% Squirtle spins on its side, sweeping forward with its tail. It is Squirtle's slowest tilt (frame 8), but also its most powerful, KO'ing at about 150% at the edge of Final Destination. 8% (clean), 7% (late) Squirtle leaps forward a small distance, doing a drop-kick. Comes out on frame 8, while the late hit begins on frame 12. The clean hit KOs at about 335% on Final Destination. 15% Squirtle leans back, then swings its head forward while spitting water. Can be angled. KOs at about 75% at the edge of Final Destination. 3% (initial ground hit), 13% (clean), 12% (early), 10% (mid), 9% (late), 8% (latest) Squirtle crouches down and then stands up, creating two water geysers simultaneously, one on each side of it. There is an early hit on grounded targets which deals fixed knockback to launch them into the main hit. A powerful vertical finisher. KOs at about 103% on Final Destination if it hits cleanly. 13% Squirtle crouches down and spins on its shell, spitting water forward then backward. Squirtle's fastest smash attack, both in startup and FAF. KOs at about 96% at the edge of Final Destination. 10% (clean), 7% (late) Squirtle turns to its side (such that the back of its shell faces the screen) and spins quickly. Comes out quickly (frame 4), making it good to combo into, and the late hit lasts a while (frame 7-26), making it good for approaching or edge-guarding. KOs at about 155% at the edge of Final Destination. 7% (clean), 6% (late) Squirtle thrusts both its legs forward. Comes out quickly (frame 5), and is good for combos. The clean hit KOs at about 170% at the edge of Final Destinaton. 1% (rapid hits, up to 5), 6% (final hit) Squirtle thrusts its tail backward, spinning around in a multi-hit attack. Comes out quickly (frame 5). Has the highest landing lag of Squirtle's aerials (18 frames), but auto-cancels earlier (frame 22). KOs at about 145% at the edge of Final Destination. 7% Squirtle flips upward, using its tail to knock opponents vertically. Comes out quickly (frame 5), and is somewhat weak, but it is a potent juggling and combo tool. Of Squirtle's aerials, this has the earliest FAF (frame 30) and auto-cancel window (frame 20), as well as low landing lag (6 frames). KOs at about 190% on Final Destination. 1.5% (rapid hits, up to 5), 4% (final hit) Squirtle thrusts its tail downward, spinning around in a multi-hit attack similarly to back aerial. Comes out quickly (frame 6), though later than Squirtle's other aerials. Has high landing lag (16 frames) and auto-cancels relatively late (frame 35). KOs at about 250% at the edge of Final Destination. — Squirtle grabs the opponent with one hand. 1% Squirtle headbutts the grabbed opponent. Decently fast. 2% (hit 1), 6% (throw) Squirtle puts the opponent in front of itself and does a jumping kick on them. KOs at about 165% at the edge of Final Destination. 8% Squirtle lifts the opponent with both arms and tosses them behind itself. This move turns Squirtle to face the other direction. Squirtle's strongest throw, KO'ing at about 120% at the edge of Final Destination. 2% (hit 1), 5% (throw) Squirtle tosses the opponent above itself and headbutts them in a similar manner to its up tilt. Good combo potential, leading into neutral aerial at lower damages and up aerial until about 60%. KOs at about 295% on Final Destination. 2% (hit 1), 5% (throw) Squirtle puts the opponent on the ground and then slams onto them with its shell. This is a good combo throw, leading into forward aerial and up aerial at a variety of percentages. KOs at about 240% on Final Destination. 7% Squirtle spins around onto its feet while swiping its tail forwards and then backwards. 7% Squirtle spins on the back of its shell while swiping its tail forwards and then backwards, then hops up onto its feet. 5% Squirtle stands up while swiping its tail forwards and then backwards. 9% Squirtle climbs up and whips its tail forward. Being slow to come out, this attack should be used cautiously (it takes 28 frames to come out, compared to Ivysaur's 21 frames and Charizard's 24 frames). Water Gun 0% Squirtle charges up, then spits out streams of water. The water does not deal damage or cause flinching, serving only to push opponents, similarly to Mario's F.L.U.D.D. The move can be charged for up to around one second. The charging can be cancelled by either pressing the special button, which uses the move at its current charge, or by jumping, shielding, or rolling, all of which preserve the current charge. The charge is still preserved when switching to other Pokémon, but is lost upon being KO'd as Squirtle. The longer the move is charged, the more water is sprayed and the further it will travel, increasing the move's effectiveness. The spray of water can also be angled. Withdraw ~13% Squirtle retreats into its shell and slides across the stage at high speed. If it hits a wall, it will continue sliding in the opposite direction; if it hits an opponent, it bounces out of its shell and the move ends. Throughout the move, Squirtle is immune to damage, but can have its sliding trajectory altered by knockback. Additionally, if Squirtle is footstooled on during the move, it is put into a vulnerable state for about two seconds as it lies on the ground, stuck on its back. If the move is performed with a tap input, it travels a bit further and faster, and deals a bit more damage. Waterfall 1.4% (rapid hits, up to 7), 3% (final hit) Squirtle creates a wave of water and rides it upwards. The attack deals multiple hits, and is difficult to interrupt as a recovery move, as the hitbox is large, disjointed, and directly in front of Squirtle. The movement direction of the move can be slightly altered with the control stick to be more vertical or more horizontal. Squirtle becomes helpless after using this move. Pokémon Change The Pokémon Trainer calls Squirtle back by throwing a Poké Ball at it, and then sends out Ivysaur. Triple Finish ~50% total The Pokémon Trainer sends out both Ivysaur and Charizard, and all three Pokémon perform a combination attack involving powerful trapping attacks with long horizontal range. For Squirtle's contribution to the attack, it uses Hydro Pump, a large cone-shaped vortex of water that pulls nearby opponents into the attack. Pokémon Trainer releases Squirtle from its Poké Ball while saying "Go!" or "Squirtle!" Up taunt: Backflips and then poses with its arms spread in celebration, saying "Squirt". Side taunt: Spins on its tail, then gets dizzy as it stops, saying "Squirtle, Squirt". Down taunt: Goes into its shell and spins around vertically, doing a hop, and then poses as it comes out of its shell. Leans forward and waggles its arms in front of itself. During Squirtle's victory poses, the Pokémon Trainer says randomly either "You all did great!" (male)/"Everyone did great!" (female) or "Good job, Squirtle!" (よくやったな、ゼニガメ！), while the female Trainer can say "We did it, Squirtle!" (やったね、ゼニガメ！). Pokémon Trainer holds Squirtle in his arms, then kneels down and puts it on the ground, and rubs its chin and head. Pokémon Trainer was among the fighters that were summoned to fight against the army of Master Hands, and he brought his three Pokémon with him. Squirtle was sent out by Pokémon Trainer, along with Ivysaur and Charizard, shortly before Galeem unleashed his beams of light. Under Pokémon Trainer's command, Squirtle used Water Gun in an attempt to fight the beams of light, but this attempt failed. Pokémon Trainer, Squirtle, Ivysaur and Charizard were all vaporized and placed under Galeem's imprisonment along with the other fighters, excluding Kirby. Pokémon Trainer can be found at the southeast near the maze that resembles Pac-Maze. Defeating him allows access to all of their Pokémon. Squirtle's Fighter Spirit can be obtained by completing Classic Mode. It is also available periodically for purchase in the shop for 500 coins. Unlocking Squirtle in World of Light allows the player to preview the spirit below in the Spirit List under the name "???". As a Fighter Spirit, it cannot be used in Spirit Battles and is purely aesthetic. Each Fighter Spirit has an alternate version that replaces them with their artwork in Ultimate. Squirtle in Pokémon Trainer's fighter card. With Ivysaur, Charizard, and a Burrowing Snagret on The Great Cave Offensive. With Ivysaur and Charizard on Skyworld. Attacking Inkling with Water Gun on Pokémon Stadium 2. Struck by Lucario on the Bridge of Eldin. With Ivysaur and a giant golden Pikachu on Pokémon Stadium 2. This page was last edited on April 17, 2019, at 20:34.